A USDA grant will allow a group of California organic farmers to team up with researchers from the University of California, Chico State and Fresno State to determine whether tilling less soil on the farm will improve production of vegetable crops. The aim is to duplicate the soil environment found in natural areas – typically concealed by plants, leaves and other organic debris – to improve agricultural soil health, increase production, reduce water use and avoid leaching nutrients out of the root zone. A group of organic farmers, shown above, are working with UC researchers to minimize tillage and optimize soil characteristics on their farms. The three-year project, funded with $380,000 from the USDA Natural Resources Conservation Service's Conservation Innovation Grant program, involves six organic farmers who are already experimenting on their own with cover crops, compost and minimum tillage to grow high-quality organic produce. One of the participants, Scott Park of Meridian, Calif., 50 miles north of Sacramento, has been building the soil on his farm for 38 years. Park said he tweaks his farming practices each year. To date, he has tinkered with reduced tillage, but isn't sold on a no-till system. “I'm doing minimum till now, but it can be better,” Park said. 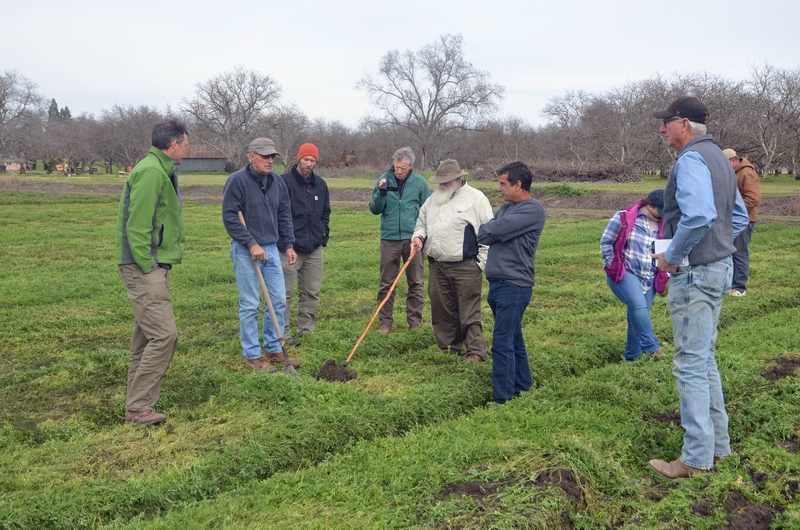 Teasing out those improvements is a goal of the project, which includes trials on four farms and two 12-acre demonstration plots, one at the UC West Side Research and Extension Center in Five Points and the other on the Chico State campus. “Each of us will be trying to get closer to the goal of reducing tillage to promote soil health. We all want to develop strategies that might work, and not repeat mistakes,” Mitchell said. The USDA grant funds will enable the farmers and researchers to gather accurate data about the agronomic and economic impacts of the new farming systems and use state-of-the-art equipment and technologies as they experiment with new techniques. For example, the team is working with a Salinas company that is bringing a Spanish transplanting technology to California. The company, Tanimura & Antle Produce, will allow a demonstration of a plant tape that holds sprouts spaced ideally for a broccoli field planting in the West Side REC plot. (See video below or on YouTube at https://youtu.be/6pkmQVNjH1I .) The technology holds promise for reducing tillage, cutting back on labor, using less seed, and bringing the crop into production earlier in the season. Planting cover crops is another way farmers and researchers will seek to improve soil health, though this process is a challenge in organic farming systems. On conventional no-till and minimum-till farms, the cover crop may be sprayed with an herbicide before planting seedlings in the cover crop residue. Possible solutions are chopping up the cover crop or using a roller-crimper machine. “These technologies would provide considerable advantages in organic systems, but very little research has been done to quantify how these practices might influence soil function and cropping system resilience in California,” Mitchell said. As part of the project, a farmer network will be developed for information sharing, 18 public extension events will be held, six videos will be created and curriculum will be developed to extend the research outcomes. For more information, contact Jeff Mitchell at jpmitchell@ucanr.edu, or (559) 303-9689. In the video below, see an overview of transplanting technology developed in Spain that will be part of the soil building research.